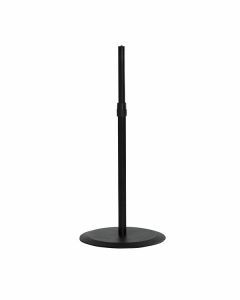 Stable steel stand with a broad round cast iron base. Base diameter is 450 mm. Adjustable in height using clamping screw and safety pin. Mounting 3/8" thread for any Genelec stand plates, from 8020B to 8050A model. Load capacity: 35 kg. Weight: 10.6 kg. Height: 950 to 1430 mm. Packing: double cardboard packing; iron base in one and stand in the second. Suitable for: 8020B, 8030A, 8130A, 8040A, 8240A, 8050A and 8250A.